We all knew the day had to come at some point but it feels maybe a season too soon, and now certainly two games too soon. 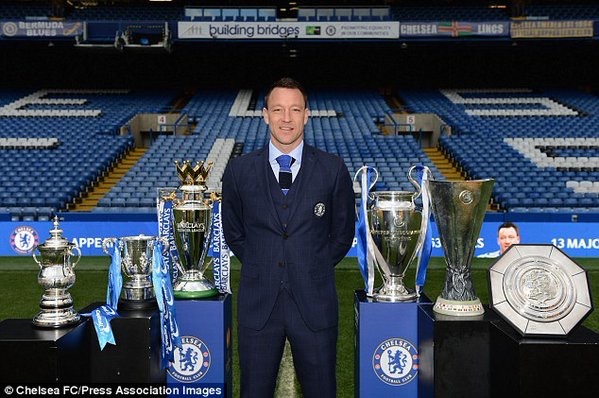 With the club remaining as tight-lipped, and tight-pocketed as they have all season, it seems John Terry’s Chelsea career has come to an end. There’ll be some of us who’ve watched his entire career develop, as he’s grown from his debut as an 18 year old, into our our highest scoring defender, our most successful captain, a leader and yes, ultimately a legend at Chelsea Football Club. There’ll also be some, who remember only JT in our back line. From 2001/02 alongside Desailly and the season where he first wore the captain’s armband, and Mourinho subsequently making him captain in 2004/05, John Terry has been a mainstay in the Chelsea defence, leading us to four Premier League titles, four FA Cups, three League Cups and one UEFA Champions League. He’s made mistakes in that time of course, doesn’t everyone? Most just don’t grow from boys to men in the public eye, with every aspect of their private lives critically scrutinised by pens driven by money rather than conscience. Unfortunately for John Terry hatred in this country is bred by the offering of a morsel in the media and nourished by the intermittent drip-feeding of anyone gullible enough to enslave themselves to headlines. Some glass houses are afforded the insurance of privacy but then they aren’t throwing their bodies on the line week in, week out. The protected few, speaking and behaving in whatever manner they choose without reproach, no matter how disgraceful, protect themselves with the notion that this vitriolic conduct is earning a living. Whilst earning his living, John Terry has played 700 times for Chelsea, most of that as our captain. In a world where that level of commitment to any one club is as rare a commodity these days as an unbiased press report, is it ‘fitting’ that a player with this level of loyalty bows out without the same level of recognition from the club as he has from the supporters? He hasn’t had a good season but then who has? At least he has age and the level he’s played at for the past 15 years or so as an excuse, which is more that can be said for those around him, offered new contracts whilst he’s been pushed ever closer to the exit. I don’t doubt he’s caused as many stirs inside Stamford Bridge as he has outside of the club but true leaders aren’t meek and mild. He wears his heart on his sleeve, which is exactly why he’s been the best captain Chelsea have ever had, yet we’re led to believe this ‘influence’ at the club might not sit well with the incoming Conte. The sacking of Jose Mourinho in December, swiftly followed by the announcement that John Terry wouldn’t be getting a new contract were never going to improve our mentality or form. The loss of big player after big player at the club has had a cumulative impact we’re now seeing the fallout from. The lack of leadership at Chelsea this season, with characters like Ballack, Lampard, Drogba and Petr Cech, phased out and not replaced, has been all too apparent as we’ve dragged our feet from game to game. Yet Chelsea believe they can lose the ultimate leader to make the new manager’s seat more comfortable? I, for one, would expect Conte to have more backbone (not to mention common sense) than that. We’ve watched as the spine of Chelsea has been eroded over several seasons with the odd band aid thrown at it to hold it together. Take the ‘head’ out as well and that steady ‘crumble’ we’ve had to endure could well result in complete collapse. Chelsea have been embarrassing on the pitch this season, I sincerely hope we don’t prove to be as shameful off it.